Mounds Dog Fest 2010 is scheduled for Sunday, June 13, 2010 from 10:00am-3:00pm at Angell Park in Sun Prairie, WI. The event will feature demonstrations, pet contests, an adoptable pet parade and tons more! 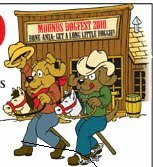 Dog Fest 2010 t-shirts are also available for purchase at all Mounds locations for $10.00. The official events calendar has been released, and it can be found here. Hope to see you there! Looking to adopt? All adult kittes at DCHS just $1! In honor of opening the Westside Adoption Center in Madison one year ago, the Dane County Humane Society is offering an awesome deal: all adult cats are just $1 until Sunday, May 29, 2010! If you've been looking to add a feline friend to your family, now is the time to do it. There are plenty of lovely adult kitties waiting for a new home...click here to meet some of the available cats. This special price is available at all DCHS locations. SmartCat Ultimate Scratching Post: coming soon! CSN Stores has generously offered to supply Mad About Pets (and of course the Mad About Pets cats!) with a SmartCat Ultimate Scratching Post from one of their online stores! All Modern Pet offers everything from pet sofas to litter box hideaways. The best part is all the products have a modern aesthetic, making them a great addition to any décor. 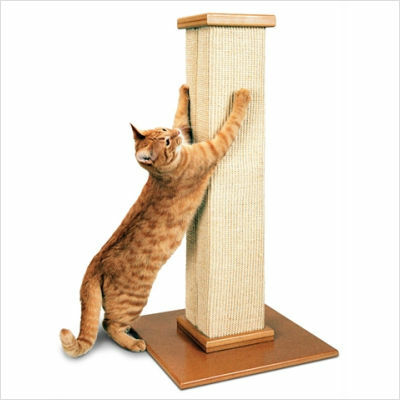 The Ultimate Scratching Post should be on its way soon, so look forward to an in-depth review in the near future! The Mad About Pets cats will give it a test drive and I’ll let you know what the humans and kitties alike find out. In the meantime, make sure you check out All Modern Pet for a huge selection of unique pet products. Living in a shelter is very stressful for any cat, but few realize the extreme challenge that Siamese cats and other Oriental breeds face when in a shelter environment. Oriental breeds tend to be extremely emotional cats and bond very closely to their humans. Being torn away from what they perceive as their family can lead to emotional trauma that manifests itself in many ways, from aggression to depression. Our family has experienced both ends of the spectrum. When we first met our Siamese cat Gabe (photo: left), his shelter chart stated that he was “shy, but sweet.” Staff had a difficult time socializing with him; in fact, when a staff member took him out of his cage for us to meet him, Gabe hissed at her! We were a little concerned with the aggressive display, but once we were alone with Gabe in a socialization room we realized that we had nothing to worry about. He immediately began meowing with that typical Siamese yowl, investigating the room, and rubbing up against our legs. This is a perfect example of how being confined to a small cage can bring out particularly aggressive or antisocial behavior in a Siamese cat—tendencies which may cause the cat to be labeled as “unadoptable”, when in reality the cat is just under a lot of stress. As a side note, Gabe has never hissed at another person or animal since the day we brought him home. He is also the polar opposite of “shy”; he is the first to greet new visitors, and a total ambassador for the positive qualities of the Siamese breed. 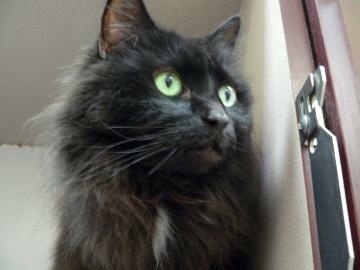 On the other side of the coin, outgoing cats can become shy and reclusive in a shelter situation. When my husband and I were searching for our first cat together, we barely noticed the shy Siamese mix sleeping in a tiny, tight ball in the back of her cage, facing away from visitors. We gravitated towards all the kitties reaching their paws out for attention or meowing hopefully; thankfully a staff member pointed out the Siamese mix to us. The cat’s name was Tinker (photo: far right, with Gabe). We chose to adopt her, and she turned out to be very different from the shy little ball in the back of the shelter cage. Tinker was the most snuggly, amazing, sociable cat anyone could ever ask for. She slept on the pillow with me every night, and even took naps with me on the couch while I clutched her like a living teddy bear. Guests to our home could expect to have Tinker on their lap, whether they liked it or not. Tinker’s story is an example of how many Siamese cats can become reclusive when living in a shelter. All-too-often these cats are passed over in lieu of their more overtly outgoing neighbors, and can face long shelter stays or even euthanasia as a result. Beyond aggression and reclusive behaviors, some Oriental breeds will even become self-destructive in a shelter. Due to their extreme emotional sensitivity, stress can lead to behaviors like stress-licking, where the cat will lick off its own hair. In some situations, a stressed cat will refuse food. This can lead to rapid weight loss (including muscle loss), illness, and sometimes even death. Sensitive cats like these can literally give up on the will to live. Thankfully, some rescue organizations (like the Pure Bred Cat Rescue here in Wisconsin) have recognized the particular plight of Oriental cats in shelters and will place these cats into their experienced foster homes. A home environment is much less stressful for a cat awaiting adoption or recovering from a neglect situation, and can potentially prevent serious emotional and physical problems which might occur in a shelter. Even if a Siamese or Oriental cat (or any cat for that matter) experiences a very stressful stay at the shelter, it is imperative to remember that most emotional and physical issues resulting from that time are only temporary. The cat will require patience and time to bond with his new family, but the results of that effort can be astronomical. It may take a few weeks (or months, or even years) before the cat will stop hiding under the bed or start actively seeking your company, but watching a cat blossom to their full potential is a very rewarding experience. 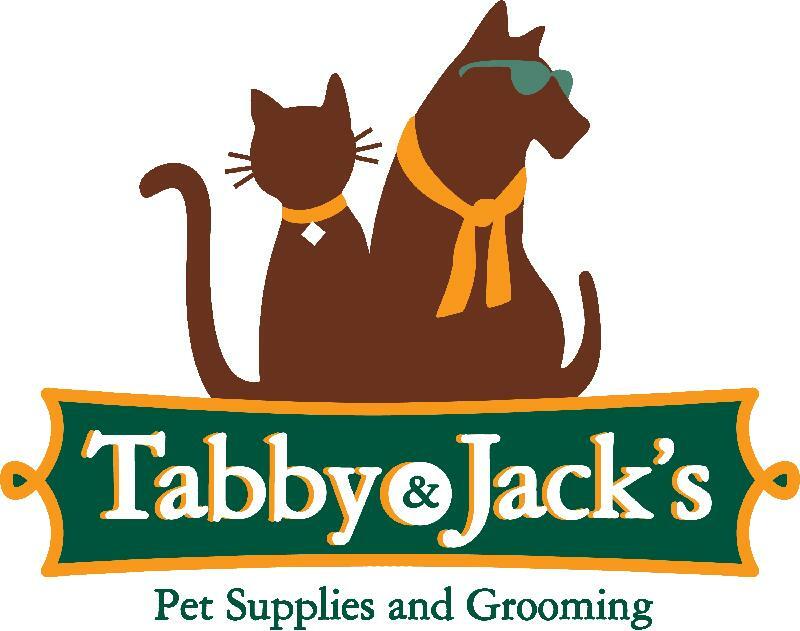 Tabby & Jack's is having a sidewalk sale this Friday and Saturday (May 14 & 15, 2010)! This is their biggest sale of the year. There will be lots of great sales, giveaways, vendor promotions and a drawing for valuable prizes! There will also be free nail trils for dogs from 11-3 on Saturday. I just ran across this very cool pet dish and thought it was worth sharing! It's manufactured by a company called PetzPaws. 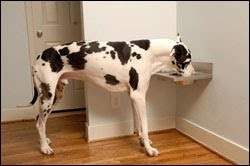 The dish is very unique because the unit mounts to the wall, so it is completely customizable to the height of your pet. This is very useful for especially small or especially tall animals, as the more you can minimize the stooping of your pet while they eat, the better their digestion and ease of eating will be. 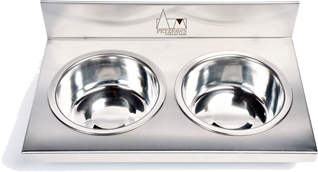 The bowls and unit come in different sizes, so you can choose the right size for your pet. My favorite part is the sleek stainless steel design. "PetzPaws Dinnerware is the most elegant way to let your pet know he or she is always welcome to dine with the family. Currently available in Stainless Steel with more styles coming soon, PetzPaws Dinnerware can fit in with the décor of any home. To add function to form, our movable, wall mounted dinnerware is customizable to your pet’s height and brings your pet’s bowls off of the floor to create a more comfortable dining experience for your pet that may also help prevent medical problems like bloat. It also make clean up simple by reducing spillage since pets can’t move it and people can’t knock it over. The dinnerware and removable bowls are dishwasher safe. PetzPaws Dinnerware is easy to install and relocate, available in 4 sizes and made for you in the USA."